Economics and Business Economics at Radboud University does not only involve numbers; psychology, sociology, and politics also play a role. Therefore, we, in Nijmegen, also look at social issues such as income inequality, the causes of a crisis, and the impact of culture on the economy. You will look at financial choices and decisions that organisations make, and the national and internationals rules that have to be taken into account while making those decisions. After having studied the first year of the Bachelor's programme Economics, you can choose to study one of the four tracks during the second and third year of the Bachelor's programme: Business Economics, Financial Economics, International Economics and Business, and International Economics and Policy. In the third year, you have the opportunity to study abroad at a partner university for a semester. In the International Economics and Business track, an obligatory semester of studying abroad is included in the curriculum. During your time abroad, you have the possibility to select courses of your choice within the field that you wish to specialise. In Nijmegen, we offer a distinctive way of looking at economics: bits and pieces of psychology, sociology, business administration and law are included in the studies of economics. Furthermore, Economics and Business Economics in Nijmegen gives you the opportunity to study in a very personal and interactive environment. Besides lectures, there are weekly tutorials in which you will have intensive interactions with the lecturers, the professors, and the students. 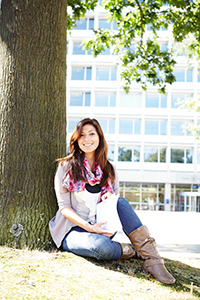 1e jaar The first year of your studies will be an introduction to the programme. You will learn economic techniques and get acquainted with economics research. At the end, you will conduct your own research project with fellow students, in which you combine the theoretical knowledge of the first year with practical insights. 2e jaar After the first year of Economics and Business Economics, you can choose four tracks to continue your studies in the second and third year. These tracks are Business Economics, Financial Economics, International Economics and Business, and International Economics and Policy. For more information about courses, please visit http://www.ru.nl/bachelors/economics. 3e jaar During the first semester of the third year, you have the option to study abroad at a partner university; in the International Economics and Business track, this is obligatory. You can also spend the semester abroad to do a research internship. In the second semester, depending on your track, you will take a mix of compulsory and elective courses. You will complete your third year with a bachelor thesis. For details, please visit www.ru.nl/bachelors/economics. In this track, you will be trained in accounting and corporate finance. The track can be related to the professional fields of accountancy, control and financial management. During the track Business Economics, you will be provided with the skills and knowledge that is needed to become an expert in corporate financial management. You will be trained in accounting and corporate finance. The track can be related to the professional fields of accountancy, control and financial management. After graduating, you will be able to instruct managers on how to invest and acquire money. This will not just be based on financial information: you will be trained how to identify relevant information that affects financial affairs. In addition, you will be trained in strategy and marketing. You will have to learn bits and pieces of these fields to be able to cooperate successfully with project managers and other professionals during your career. Although a track with the same name is being offered in the Bachelor's programme in Business Administration, some of the courses of that track do differ. Do you wish to expand your horizons and take on an extra challenge during your studies? Then this dual degree programme with the University of Victoria in Canada might be what you're looking for. In collaboration with the Peter B. Gustavson School of Business of the University of Victoria, Canada, the Nijmegen School of Management has developed a brand-new dual degree programme: International Bachelor in Economics and Management. This programme combines the best of international economics with the best of international business and it includes three (paid) internships (called 'co-ops') in Canada as an integral part of the programme. The programme will take 4.5 years to complete, of which 2.5 years will be spent in Nijmegen, the Netherlands, and 2 years in Victoria, Canada. After having completed the programme, you will both be awarded a Bachelor of Science in Economics (BSc) degree from Radboud University and a Bachelor of Commerce in International Business (BCom) degree from the University of Victoria. Students are trained to become experts in policies of multinational companies. In this track, you will study the role of human behaviour, culture and ethics on the financial position of companies. When studying International Economics and Business, you will be trained to become an expert in policies of multinational companies. You will study the role of human behaviour, culture and ethics on the financial position of companies. The focus will be on global markets and internationally-operating companies. Students interested in choosing this track need to meet so-called 'referral criteria'. Students must have studied the first year of Economics, have obtained a positive Binding Study Advice, and have a combined average grade of at least 7 out of 10 for the three first-year courses 'Introduction to Economics and Business', 'Academic Skills' and 'Methods and Integration: Money, Banking and Financial Markets'. In this track, you study the functioning of financial markets as well as the financial products sold by banks and insurers to help companies stabilise their financial situations. Experts in trade, whether it be trade in goods, stocks or foreign currency, all studied financial economics. In this track, you will study the functioning of financial markets as well as the financial products that are sold by banks and insurers to help companies stabilise the effects of financial markets on their financial situations. You will become familiar with risk management and you will be able to come up with returns-on-investments. In addition, you will study psychological factors in financial management, for example in the course 'Behavioural Finance', in which you will study the causes of financial results, and in 'Financial Regulation', in which you will study market failure and whether there is a need for regulation. After completing this track, you will be able to advise governments and companies about financial products and you will be able to produce relevant financial information for decision making. Students become experts in international economic developments who analyse consumption, employment, economic growth and the effects they have to be able to advise companies and governments. As an expert in international economic developments, you will analyse consumption, employment, economic growth and what effect this has on companies, so that companies and governments can respond adequately to the latest developments. You will study why one country's economy grows faster than that of another country and what the effects of large-scale economic events in one region are on other regions, such as the recent credit crisis. You will focus on the European integration, international economic developments and the relation between development and poverty. Students with Dutch previous education can apply through Studielink, after which the Central Student Administration will handle the application. Make sure to select the study programme 'Economics and Business Economics (English)' in Studielink. Details regarding the application and enrolment procedure for students with non-Dutch previous education can be found at www.ru.nl/bachelors/economics/application/. Propaedeutics diploma from a university of applied sciences (HBO-p): allowed if you have completed VWO Mathematics A or B with a satisfactory mark. An English language certificate is not required when the first year at the university of applied sciences has been completely in English. Economics and Business Economics aan de Radboud Universiteit is beoordeeld door 180 respondenten. Gemiddeld waarderen ze de opleiding met 4.0 uit 5. Our Bachelor's programme in Economics and Business Economics provides an extensive educational programme. Graduates of this track often find employment all over the world, in fields varying from financial institutions and the business world to non-profit organisations and governments. Graduates are well-qualified for filling managerial positions in the international business world, at consultancies, and in governments. Many graduates combine consultancy and research tasks into one career. One graduate becomes an entrepreneur, whereas another may opt for a career as policy adviser, analyst or investment consultant.